The "creation of man from clay" is a miraculous birth theme that recurs throughout numerous world religions and mythologies, and has a scientific basis via Abiogenesis, or informally "the origin of life". Examples include: The Epic of Gilgamesh, Enkidu is created by the goddess Aruru out off clay. In Greek mythology, Prometheus molded men out of water and earth. Per the Old Testament (Bible), Genesis 2:7 "And the Lord God formed man of the dust of the ground, and breathed into his nostrils the breath of life; and man became a living soul". In Hindu mythology the mother of Ganesh, Parvati, made Ganesh from clay and turned the clay into flesh and blood. And lastly, in Chinese mythology (see Chu Ci and Imperial Readings of the Taiping Era), Nüwa molded figures from the yellow earth, giving them life and the ability to bear children. 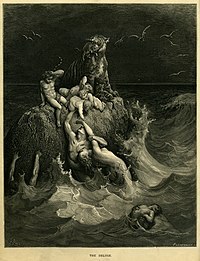 Human Cannibalism features in the myths, folklore, and legends of many cultures and is most often attributed to evil characters or as extreme retribution for some wrongdoing. Examples include Lamia of Greek mythology, was a woman who became a child-eating monster after her children were destroyed by Hera, upon learning of her husband Zeus' trysts. In Zuni mythology and religion, Átahsaia is a giant cannibalistic demon, feeding on fellow demons and humans alike. He is depicted as having unblinking bulging eyes, long talons, and yellow tusks that protruded past his lips. The myth of Baxbaxwalanuksiwe, in Hamatsa society of the Kwakwaka'wakw indigenous tribe, tells of a man-eating giant, who lives in a strange house with red smoke emanating from its roof. The theft of fire for the benefit of humanity is a theme that recurs in many world mythologies. A few examples include: In Greek mythology, according to Hesiod, the Titan Prometheus steals the heavenly fire for humanity, enabling the progress of civilization. In the Book of Enoch, the fallen angels and Azazel teach early humanity to use tools and fire. Per the ancient Indian collection of Vedic Sanskrit hymns,the Rigveda (3:9.5), speaks of a hero Mātariśvan who recovered fire which had been hidden from humanity. This myth of the gods conquering demons – and order conquering chaos – is especially common in Indo-European mythologies. Some scholars suggest that the myth reflects the ancient Indo-Europeans' conquest of native peoples during their expansion over Europe and India. Frankfort, Henri. "The Dying God". Journal of the Warburg and Courtauld Institutes 21.3–4(1958): 141–51. Graves, Robert. "Jungian Mythology". The Hudson Review 5.2(1952): 245–57. "Le motif de Pygmalion : origine afrasienne et diffusion en Afrique". Sahara, 23, 2012c: 49–59 . Untitled book review. History of Religions 32.1(1992): 88–90. Taylor, Archer. "The Biographical Pattern in Traditional Narrative". Journal of the Folklore Institute 1.1–2(1964): 114–29. Tortchinov, Evgueni. "Cybele, Attis, and the Mysteries of the 'Suffering Gods': A Transpersonalistic Interpretation". The International Journal of Transpersonal Studies 17.2(1998): 149–59. Woolley, Leonard. "The Flood". The South African Archaeological Bulletin 8.30(1953): 52–54.